Also got a few hours in last night. Loved it. Only started the Division 1, so I think I will transition to that now. It really feels very similar to the first one. Felt like DLC to the first game and somehow the graphics seemed worse? I dunno, might be Destiny 2 still blinding me from all other games. Now you make me doubt myself @FarligOpptreden, started Division 1 last night and the graphics is really good, but 2 seems slightly better to me. 1 has great visuals but the clutter around your feet seemed better done in 2. Both run very well at 100+ frames so I’m happy with that. The gun play feels very similar between the two, with modding slightly changed in 2, but then I’ve not done much in regard to equipping mods. I was having too much fun killing randoms. The thing that popped out the most was that in 1 you have a lot of innocent people running about, where in 2’s demo you only saw friendly patrols or enemies. I dunno, the world seemed more “real” to me. It’s probably the art direction in the first game that felt better, which made it seem like the graphics being better. Granted, I didn’t fiddle with the settings as much in 2 as I did in 1, which might also contribute. But you’re right about the streets feeling empty - I noticed that immediately after leaving the base of operations. Like I said, I haven’t even scratched the surface of the first game yet (even though I’ve spent 24 hours in the game), so I still have a ton of content to work through. I’m grinding my way up to start on the Underground procedural content, which is apparently quite similar to Diablo 3’s rifts, which I adored. I think the biggest contrast is that in 1 you are stating in Winter. So everything is covered with snow, which feels like it adds a lot of crispness to the scene. But that said it could also be that the details was higher in 1 than the demo. Now that I think of it, the cars’ detail in 1 feels like it could be higher as well. The buildings in the demo in contrast was sharper and more interesting than 1. In 1 they are there, but they are kiinda “blocky” and do not feel as immersive when you see them. I’m referring to the outside of the building not the interior of building maps. Will have to wait until 2 is out to compare properly, but so far I am eager to get 2 once I’m done with 1 for sure. I’ll personally wait a good 6-9 months before getting the sequel, as the first game was riddle with problems when it first launched. By that time it would also be a bit cheaper as well, possibly even parading around in a sale. The Division 2’s March 15 launch date is fast approaching, and Ubisoft is offering a special reward to players who pre-order the game on PC: a free copy of Ghost Recon Wildlands, Watch Dogs 2, or Far Cry Primal. Starting on February 13, all you have to do to take advantage of this deal is pre-order The Division 2 PC digital version (standard, gold or ultimate edition) from the Ubisoft Store or any official retailer on or before March 14, 11:59 PM PT. And don’t worry if you’ve already pre-ordered; you’ve got a free game coming your way too. Here’s how it works. Simply pre-order any digital PC edition of The Division 2 and activate it in your Uplay library. You will receive email instructions on how to select and redeem your free game. If you’ve already pre-ordered The Division 2 on PC, be sure that it’s activated in your Uplay library, and then visit http://thedivisiongame.com/freegame for instructions on how to proceed. If you have purchased a digital copy for PC on Ubisoft Store or Epic Games store you can choose from 3 free games on offer subject to terms and conditions. Pre-Order Tom Clancy’s The Division 2 PC Digital version (standard, gold or ultimate edition) on or before March 14, 2019, 11:59pm. As soon as your copy appears in your Uplay games library you are entitled to choose one PC digital game of your choice from the following: Watch Dogs 2, Ghost Recon Wildlands or Far Cry Primal (all standard editions). You can redeem your free game until March 31, 2019, once validated your free game will be added to your Uplay games library and you won’t be able to modify your choice. You will be able to play this game upon The Division 2 release date on March 15, 2019. If you cancel your preorder, the free game will be removed from your Uplay game library. Dates may change at Ubisoft’s sole discretion. Promotional offer. Void where prohibited or restricted. Ubisoft Account and internet connection required to register and/or play. Content and system requirements pending; check all requirements/details/restrictions prior to purchase/redemption. 50 bonus UPlay Points is my guess. I think it’s a pretty weak incentive all round to be honest. Maybe I’m wrong, but I can’t think of any PC gamer that will be swayed to pre-order TD2 based on this offer. Those that do still do pre-orders have already done so in order to get into the private beta last week. And those that don’t do pre-orders probably aren’t going to converted, unless they really, really want one of those three. Has anyone else gotten an email about participating in a technical test today and tomorrow? Try the Open Beta this weekend (1-4 March). That should give you a clear indication if it’s a game for you or not. 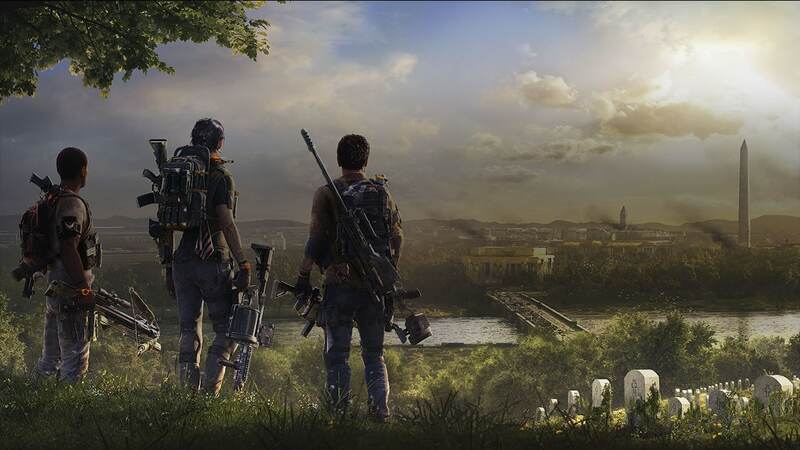 Announced through Twitter with additional details shared on the official Division 2 website, the Open Beta spanning from March 1-4 on PC, PlayStation 4 and Xbox One will include three main missions, five side missions, a Dark Zone and more. I got a fairy good idea of how the game will play and to me it felt mostly like Div 1. The first game was fun to play and the story was pretty good but i don’t feel like playing something so similar at the moment. So for now i’m thinking of just giving it a skip. There are just to many similarities to the first game honestly.